In addition to our repair services for gas laser products, we also service and repair a number of solid state (diode) laser products. 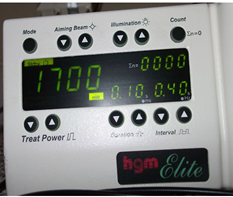 This week we finished repairing an HGM (Lumenis) Elite 532 laser system. This entry was posted in Uncategorized and tagged Elite 532, hgm, Lumenis, repair, service. Bookmark the permalink.